Crime perpetrated by healthcare professionals is increasingly pervasive in today’s hospitals and other healthcare settings. Patients, coworkers, and employers are vulnerable to exploitation, fraud, abuse, and even murder. 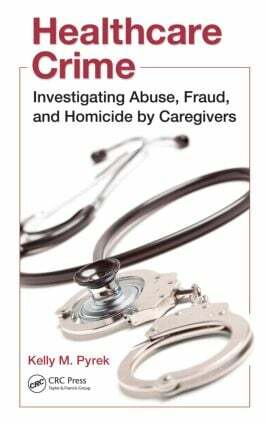 Investigative journalist Kelly M. Pyrek interviews experts who provide accounts concerning the range of criminality lurking in the healthcare setting in Healthcare Crime: Investigating Abuse, Fraud, and Homicide by Caregivers. The book begins by offering perspectives on how the stressors inherent in the healthcare profession can contribute to aberrant behavior by medical practitioners. It then examines breaches of patient privacy, which can easily occur in today’s age of technology. Highlighting appalling cases of exploitation, the book also suggests guidelines to safeguard patient privacy. In a chapter on abuse and assault, the book cites psychological studies that explain the root causes of victimization. It highlights the patient populations most at risk: disabled, psychiatric, and elderly, and identifies the chief victimizers: physicians, psychiatrists, dentists, pediatricians, and nursing assistants and aides. The book also examines the types of financial fraud and theft that can be perpetrated against not only patients but also employers and government agencies, and provides expert insight on how to take preventative measures. Providing accounts of well-known healthcare-related homicides and suspicious deaths, the book also presents insights from forensic and serial murder experts as to why these incidents occur, warning signs to watch out for, and how to conduct a proper investigation. The final chapter examines simple, straightforward strategies for improving the level of quality of care and safety provided by healthcare institutions. With greater accountability and oversight, patients can once again feel secure that their providers are embracing the maxim "Above all, do no harm." Is Patient Privacy a Fallacy? What Is Happening with Medical Murder Now?